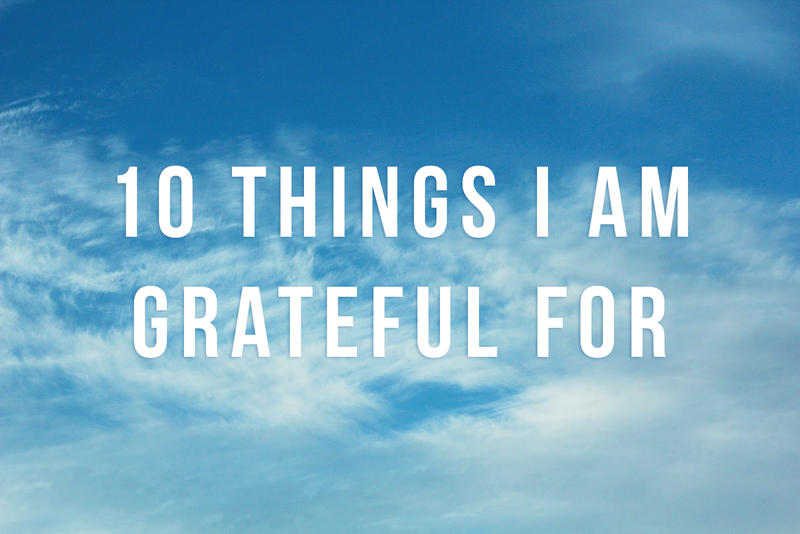 Something I've struggled with over the years is being grateful for all that I have. I've never been content with all the things I have and have either wanted more, or desperately wished things were different. In the process, I ignored all of the great things and people I've had in my life. Gratitude is something I'm trying to practice a bit more, as it's so important if you want to be happy and content with life. My Dad. I only had my dad for eight years but he was the best dad I could've ever asked for. So many of my friends have issues with their dads and during high school I used wonder why they were complaining and think to myself "at least you have your dad". Since then I've learned more about the issues my friends deal with when it comes to their dads and I feel more grateful for mine every time I hear about it. I feel like my dad was so great and provided me with a lifetime's worth of love so I didn't need him for years and years to come. My Mum. We don't always get along but she's always done whatever she could for us and always did what she thought was right. Don't get me wrong, life hasn't been perfect since dad died but she really did try to raise my brother and I as best she could. That's all I can ask really. My Brother. I'm not sure where to begin with my brother. He's pretty awesome. He's witty, clever, personable and he's a great person to have laptop time with. We bicker quite often because I overreact to not feeling like he cares about me but it only lasts a couple of minutes and then laptop time is resumed. I would've gone crazy when I was a teenager if it wasn't for him. My High School Best Friends. No matter how many times people say "high school is the best time of your life", it doesn't make it true. However, it is a completely memorable time with lots of ups and downs and your friends are the ones that help you get through it. As you meddle your way through puberty, high school drama and trying to figure out what the heck you're going to do with your life when you leave that place, your friends are there every day to carry you through. High school friendships don't always last and I'm very grateful that mine have. The Opportunities I Have. My dad gets the credit for this one for building me up and letting me do the things I wanted to no matter what. I've never been told I can't do something because of who I am or physical attributes I possess. I've had a lot of people in my life who have indulged my wildest fantasies about the careers I could possibly have and in a world where people like to tear down others I consider myself very lucky. Compliments. I'm not someone who gives or receives compliments often - I find receiving them very awkward and I just am very self-deprecating in general which is magnified when I receive a compliment. I think a lot of complimentary things about people but I find it difficult to express to people, even though it could make their day and possibly change the way they think about themselves for the rest of their life. Last year I decided that I hated my lips. I hated the way the top one was too thin on the sides and that it looked weird in comparison to my bottom lip. To hide that I never wore any lip products because I thought they looked stupid on my ugly top lip. Then, a couple of months ago my mum said that she loves my lips. Again, I shrugged it off and said "I don't" but after thinking about it and looking at them more I've decided I can live with them. In fact, I like them. Compliments really can drastically change the way people think about themselves and I think we should compliment more, even if it feels a little awkward coming out of our mouths. The things I have. Yes, I am talking about material things now. I love my dvd, camera, book, vinyl and make-up collections. I just really enjoy being able to surround myself with all the things I love. Music. Music has brought me so much over the years and I honestly can't imagine life without it. I listen to music almost all the time - I pause it to watch TV but apart from that I am always usually listening to it. One Tree Hill. This one may seem a little silly to those of you who aren't television fanatics but I'm not kidding when I say this show saved my life. Back in middle school I was really struggling with coping with my dad's death. I was angry and basically shut myself in my room all weekend and would only leave the house to go to school. For my birthday one year, I accumulated around $200 and bought a Baby G watch that I had my eye on for months. I went to K-Mart afterwards and saw One Tree Hill season one there! I picked it up straight away not believing my eyes. If you're an Australian One Tree Hill fan you'll know that the show never got a proper run on Australian television so it was necessary to have the dvd's. I remember it was $70 and I looked in my wallet and had exactly $70. I ummm'd and ahhh'd over whether I should get it but I couldn't leave without it so I got it and it was the best $70 I ever spent. I watched all 22 episodes that weekend and spent most of it crying because I finally felt connected with something and I loved something for the first time since my dad died. I really do owe that show my life and I'm not sure where I would be if I had never picked it up that day.